Two of my biggest supporters. Wherever I go on the campaign I know these 2 will be there having fun. Dave and I would like to thank you for your support. This is a great experience and I look forward to making the Auditor's Office work for you. 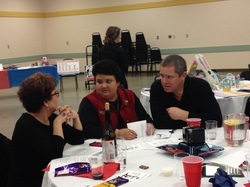 Sandy Jones talks with Kim and Craig Allen at the Lincoln Dinner. 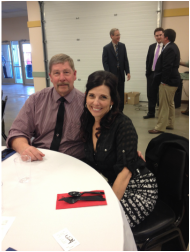 Kim is running for Re-Election for Grant County Clerk.